Have you always wanted to try Yoga, but just had no idea where to start? Are you too nervous to sign up for a class because you think you will look a fool since you can barely touch your toes? Or maybe you just don’t have any extra cash laying around to pay for a class. 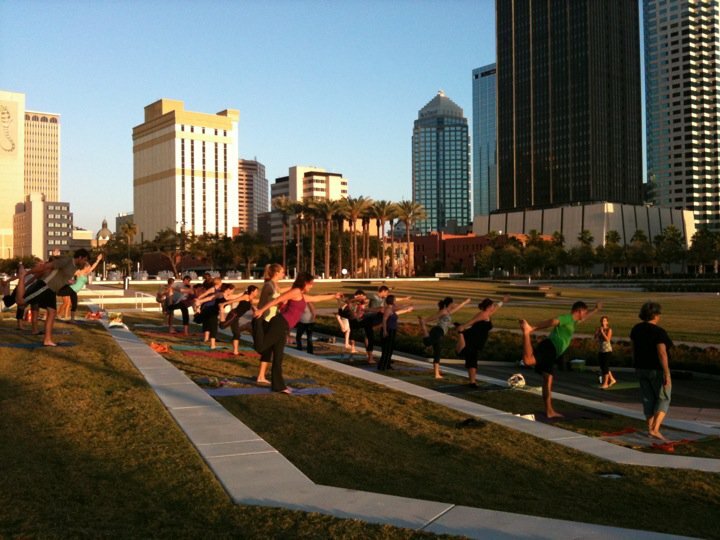 Whatever your reason is for not trying Yoga, it doesn’t matter anymore, because every Sunday, Yoga Downtown Tampa, a downtown studio, hosts a free yoga session in Curtis Hixon Park. So without spending a dime or doing any more research or practice on the downward facing dog, you can try out a Yoga class with nothing to lose. So stop saying you want to and just do it. Bring a yoga mat or beach towel to the park at 6pm on a Sunday evening and join in for some free stress reliving, mind soothing stretching and relaxation. And guys don’t be afraid. The class is for everyone and has had groups of almost 100 participants. This is a great happening in downtown. 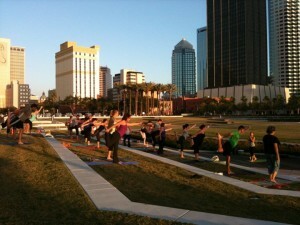 We have around 40 people every Sunday practicing yoga in the park. The time is 5:00pm since it’s too dark at 6. When it’s cold the practice is moved indoors to the Happy Buddha YOGA Lounge studio 2 blocks from the park at 206 East Cass st. Check us out on Facebook to get up to the minute updates. When you’re ready to take a workshop or another class, check out the Happy Buddha website.. I always thank the city for helping us put on this event and Realm, a division of Tampa’s Downtown Partnership. Special thanks to Shaun Drinkard of Realm. Thanks again for awarding Happy Buddha an Urban Excellence Award. Here’s to a great New Year and don’t forget to support small downtown businesses!